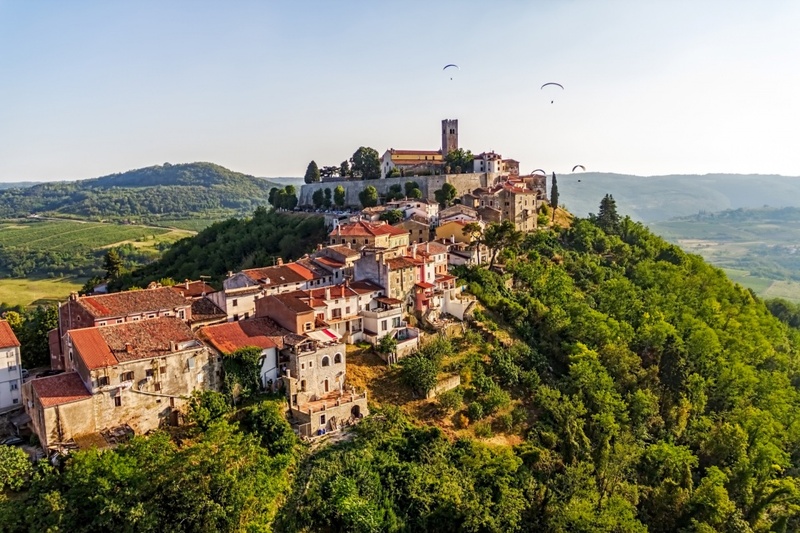 Istria has a very long and incredibly rich history, as one of the earliest inhabited areas in Croatia. Due to its fertile fields, indented coastline with protected harbors and the richness of quality stone for the construction works, Istria has been valued as a very desirable habitat since the prehistoric era to the present day. There are numerous archaeological sites in Istria confirming the existence of the early human communities. Some of those findings date back to the early Stone Age period and are believed to be up to 2 million years old. However, the richest prehistoric archaeological sites, Sandalja Cave near Pula and Romuald’s cave near Rovinj, provide a variety of proofs that the prehistoric people-hunters inhabited these areas in the period between 10000 and 40000 BC. It is believed that Istria gained its name by the prehistoric tribe Histri, who inhabited these areas from the 2nd millennium before Christ. They lived in tribal communities and engaged in hunting, farming and trading; but were mostly recognized as the notorious pirates. There are hundreds of their preserved fort-hill settlements scattered all across Istria. In the 2nd century, after a hundred years of battles, Roman army finally conquered Istria. Their 5 centuries long rule was characterized by the intensive urbanization. It is the era when first Istrian cities were formed, Pula being the most prominent one. The Romans used the quality Istrian stone to build houses, buildings and roads to connect the newly formed cities and settlements. During the medieval times, Istria changed several governors, from Byzantium to Venice In the 7th century first Croatian tribes inhabited the area. There are numerous monuments, basilicas and churches scattered across the peninsula that are preserved from that period. After the centuries long Venetian rule, Istria fell under Napoleon’s authority in the 18th century and just a few years after, it became part of the Austrian Empire. During the 19th century, major political and cultural turmoil took place in Istria. Local Croatian people fought for the national and political equality between Croatian, Slovenian and Italian inhabitants of the peninsula. Grouped around Bishop Juraj Dobrila, Croatians fought to preserve their language, culture and tradition. During the first half of the 20th century Istria was mostly under the Italian rule, suffering the intensive Italianization in all spheres of life, from the use of language to prosecution of Croatian patriots. After the World War Two, Istria was the subject of many international discussions, being divided between the newly formed Yugoslavia and the British-American authority. In 1954 the entire Istrian area was united with the Croatian territory for the first time in history. After the fall of Yugoslavia and the Croatian declaration of independence in 1991, Istria became part of Croatia, sharing its fate until the present day.